Expand your menu and boost your profit margin with the cambro versa food bar! The versa food bar is designed to help restaurants provide extensive and flexible menu options. With versatility built in, the versa food bar can accommodate frequent menu changes and merchandising requirements. 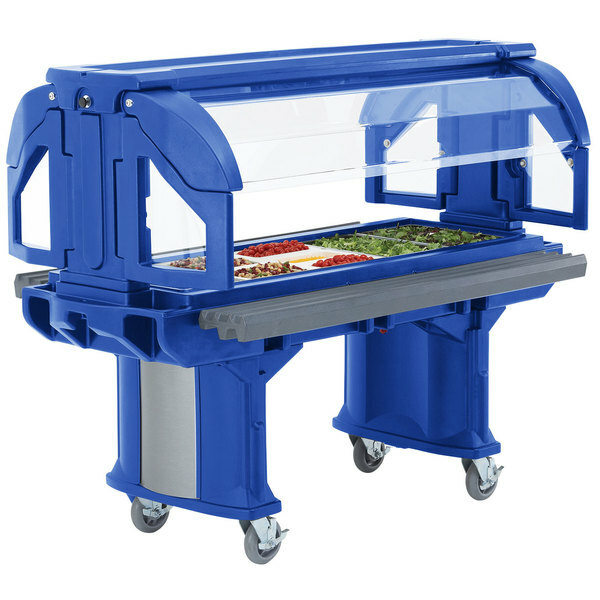 The tray rails and sneeze guards lift up and knock down for food transport and storage. This stylish and completely portable food bar is fully compliant with 2011 NSF sneeze guard requirements. 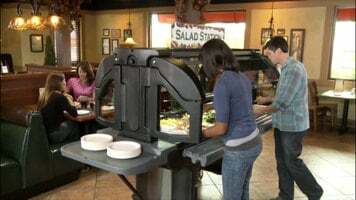 Using full size or fractional pans, cold pans, salad bowl holders and crocs, your menu can change quickly and easily. The food bar can be used with ice or without ice with the buffet cam chiller. 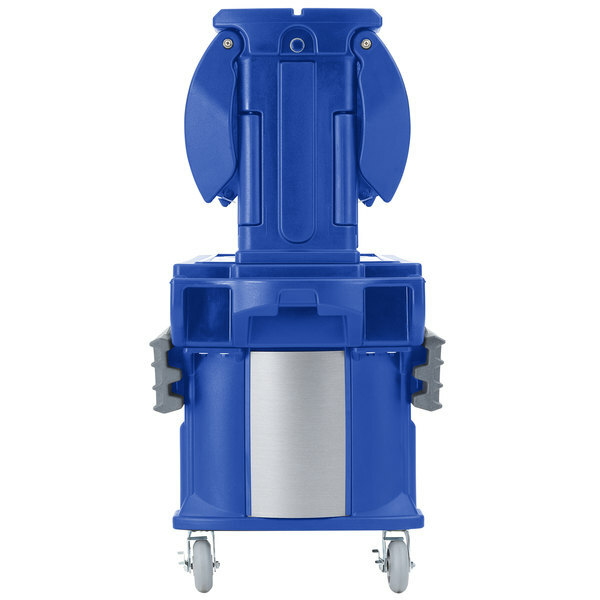 The duel sided buffet cam chiller extends cold temperatures safe holding time for hours! 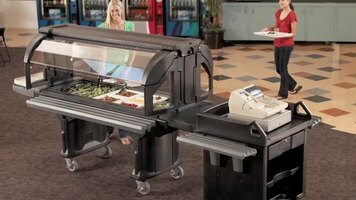 The food bar is a part of the Versa food service system; the system also includes the versa work table and the versa cart. These components can easily be connected with straight or corner connectors to create a professional, uniform look. The multipurpose work table can be used as a prep table or the ideal place for holding cold beverages indoors or outdoors. The versa cart can be used as a mobile cashier stand, merchandising station, or equipment stand. The cambro versa food bar delivers satisfaction. Expand your menu and boost your profit margin with the Cambro Versa Food Bar! See how the NSF listed Cambro Versa food bar's professional appearance and tremendous versatility make it great for flexible menus requiring frequent change. • Healthy kids need healthy food at the Cambro Versa food bar. 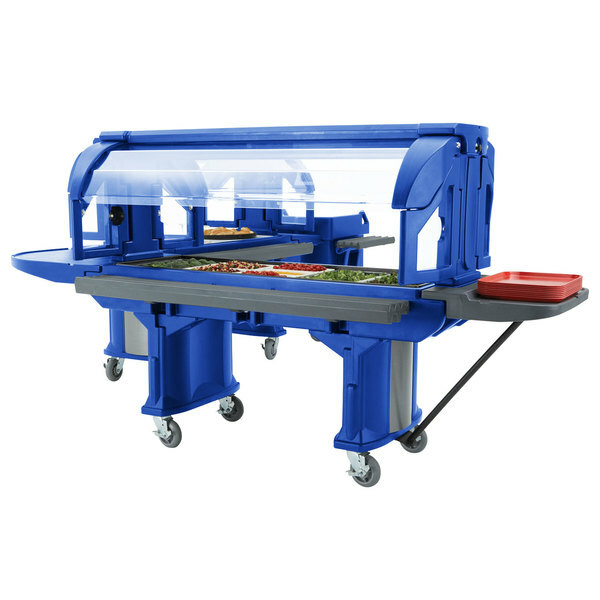 The Versa food bar is designed to help schools provide meals and snacks quickly and easily. With versatility built in, the Versa food bar can accommodate frequent menu changes and merchandising requirements. 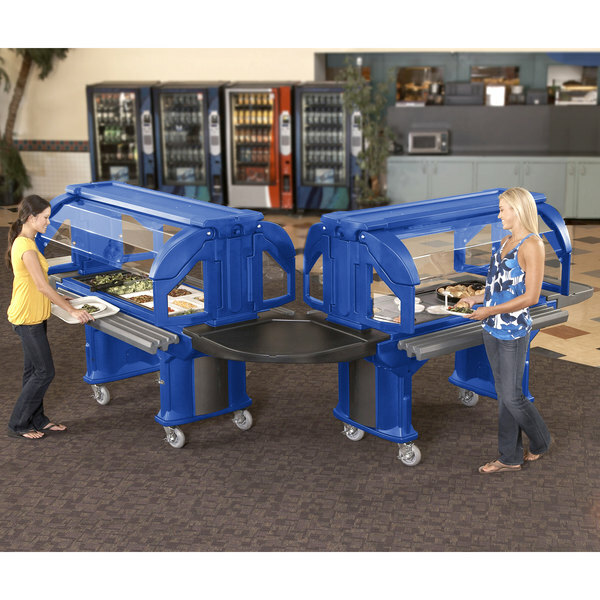 The tray rails and sneeze guards lift up and knock down for easy food set up, transport and storage. 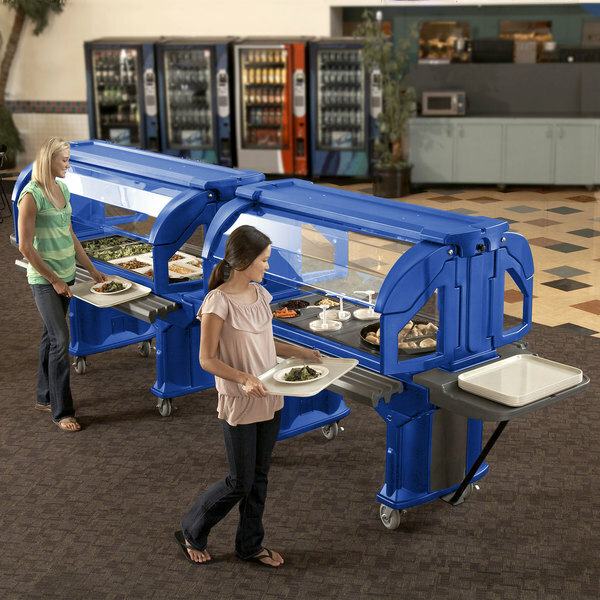 This stylish, completely portable food bar is fully compliant with 2011 NSF sneeze guard requirements. Using full size or fractional pans, cold fresh pans, salad bowl holders and crocks, your menu can change quickly and easily. The food bar can be used with ice or without ice with the buffet cam chiller. The dual sided buffet cam chiller extends cold temperatures safe holding time for hours. The food bar is part of the Versa food service system. The system also includes the Versa work table, and Versa cart. These components can easily be connected with straight or corner connecters to create a professional, uniform look. The multipurpose work table can be used as a prep table or the ideal place for holding cold beverages. The Versa cart can be used as an equipment stand, or as a mobile cashier stand anywhere on campus. The Cambro Versa food bar, delivers satisfaction. 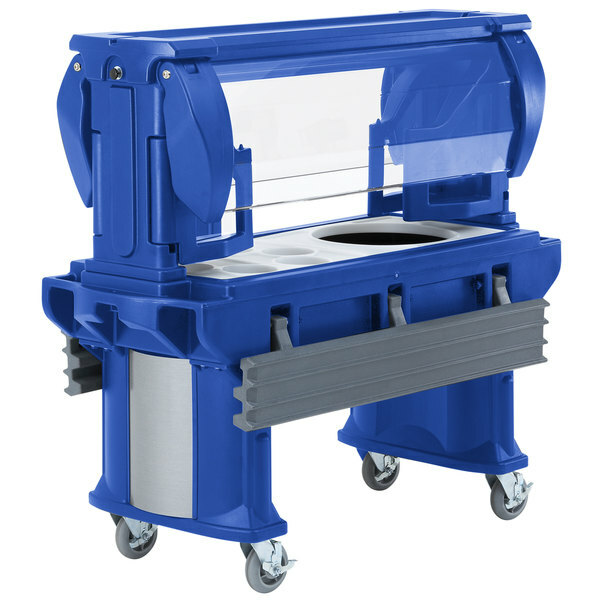 This video gives you a look at the Cambro Versa Food Bar for schools. 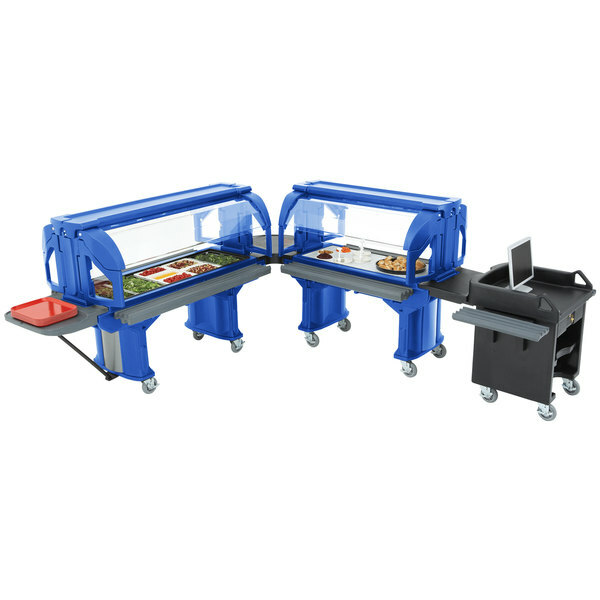 This food bar system allows schools to quickly and easily provide food and snacks, and it also accommodates speedy menu changes. This Cambro VBR6186 navy blue 6' Versa food bar offers a stylish, completely portable design, ideal for holding up to 5 full size food pans. 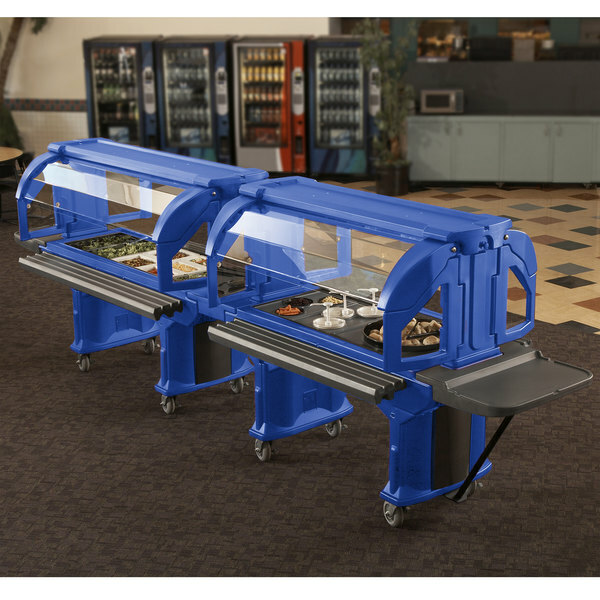 One person can easily set-up or knock down the sneeze guards and optional tray rails (sold separately) for transport or storage in only 30 seconds, allowing this unit to effortlessly fit through a standard 3' doorway. 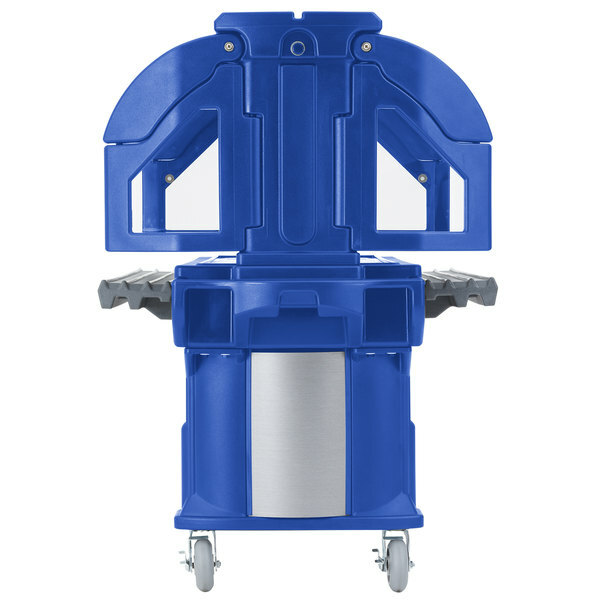 This Cambro VBR6186 6' Versa food bar provides ergonomic, molded-in handles on both sides, as well as four standard 6" casters (with brakes) to ensure easy maneuvering throughout your facility. You can even use this unit outdoors, with its durable, all-weather design.